Wynberg Upper in the Southern Suburbs showcases several properties steeped in history, one of which is Glebe Cottage on Waterloo Road. Mike Greeff, CEO of Greeff Christie's International Real Estate says, "Wynberg Upper is known for being a Village overflowing with character and history. In the last few decades, Wynberg Upper has become renowned throughout the Cape as an area filled with historical monuments. This has happened to the extent that there has even been a book written on it by Helen Robinson called 'Wynberg, A Special Place'. At Greeff, our agent in the Wynberg Upper area Lana Holt, has sold several heritage properties and specialises in the sale of these properties. As such, we are proud to have the esteemed honour of marketing this remarkable cottage - much of which has remained in the same exceptional condition as all those years ago. " Glebe Cottage is believed to be one of the earliest existing buildings in the Wynberg area. This National Monument home has a rich history that sparks hours of conversation and the design epitomises the architecture of a bygone era. The original aspects of the Cape longhouse are said to have been built in 1792 with additions to the structure built in 1812. Over the passage of time, Glebe Cottage was used by the military as a storeroom, hospital and barracks. The white-walled beauty was then home to a church and even transformed into a School of Industry in 1836. The school was established by Lady Durban, for young women who wished to enter into domestic service. 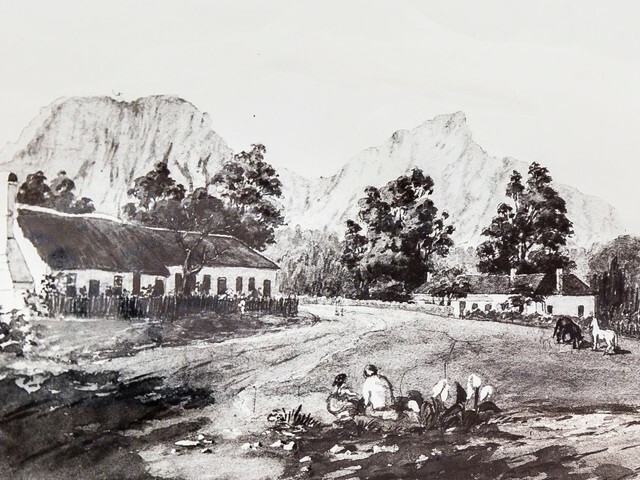 By 1841 the already highly sought-after property was being utilised as a boy's school which later became Wynberg Boys School subsequent to the school being relocated to larger premises. The land that is home to Glebe Cottage was formerly part of a farm that belonged to the military and in 1820 the military bequeathed the land to the Anglican Church. The distinctive structure was named Glebe Cottage in 1859. (Glebe land, being land given to the church.) The unique roof of Glebe Cottage tells a fascinating story as the beams of the roof were used from the church which had suffered severe structural failure which resulted in the difference in the roof's pitch. Arguably the most famous occupant of Glebe Cottage, John Human, first occupied the quaint, yesteryear home in 1874. At the time he was a parish clerk and verger as well as being a carpenter and coffin maker. He became an undertaker for the business Human and Sons with the business later partnering with Pitt to become Human and Pitt Undertakers. The wood for the coffins was matured in troughs located in the back garden of the property. The years marched steadily onward and in 1933 the cottage was required for a new priest and the last of the Humans, Nell, moved out. This marked the end of 59 years of "Human Occupation at Glebe Cottage." Glebe Cottage was then rented out by the church as the ground could not be sold. In 1973 however, the state allowed the sale of the property to its present owners who did extensive restorations and improvements. It has since been transformed into a delightful family home that keeps in mind the rich heritage and style of the building and received National Monument status in 1974. Glebe Cottage is a picture-perfect example of property being restored to its old-world charm. Several renowned artists have used the iconic cottage as an ageless and beautiful subject for their paintings including Thomas Bowler, Tom Jones, John Hall, and Don Adair. One of the most interesting facts surrounding this home is the fact that many features of the property remain the same as they did all those years ago. The home itself includes the following: a thatched and light-filled heritage property, a sun-filled room with feature fireplace, ideal large living areas, farmhouse-style kitchen with yellow-wood cupboards, main bedroom en-suite and slipper bath in the second bathroom. Choosing to purchase a heritage home is rewarding in a multitude of ways. Heritage homes are deeply connected to the history of the area and include world-class features that have withstood the test of time. In purchasing a heritage home, one may also be eligible for special grants to maintain the home as the years roll on. The rich history found in Glebe Cottage is one that cannot be measured in monetary value but rather the currency of memories made and stories to tell future generations. The home itself has been a silent witness to every single historic moment that has taken place in Wynberg's past. Glebe Cottage is a shining facet of the City's story and will always be a part of the area's landscape. Glebe Cottage is truly a cottage with the world's potential and will be an example of a property that has successfully crossed from a historical time into the 21st century and has remained as relevant and appealing today as it has been in the past.